If someone asked me what the hardest part about being married to a chef was, I would say worrying about their health and safety. The amount of hours they work in a very harsh environment are so hard on their bodies. 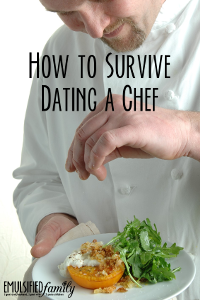 I really struggle with worrying about my chef/husband’s health. I know he’s an adult and can take care of himself, I just hate to see him in pain. He will push through it and do whatever he need to do to get the job done well and provide for us. I am grateful for that. It’s just really hard to know he’s working in pain. I loved this article which talks about an older chef and his need to move to a less physical role as a chef. It’s true. Not many people can work on the line for 40 years. Sure, some do. But I would bet they are in pain for much of the time. I’m thankful my husband has recently moved into a role that is less physical labor and seems to be easier on his body. (Although using a mouse and keyboard still cause pain in his elbow from repetitive cutting and other movements in the kitchen for many years.) I used to worry about how he’d be able to physically continue on in his career as he got older. I also struggle with worrying about his safety, usually late at night. There have been many nights I’ve laid in bed worrying he would fall asleep while driving on the way home from work because he was exhausted. It took a bad car accident and a broken back to get me through that. (You can read more about that here.) Yes, an evening of waking up suddenly at 4 am, realizing my chef/husband wasn’t home from work yet and then finding out he was in a car accident because he fell asleep. It’s a nightmare and so scary!! But sometimes accidents like that are a blessing in disguise. Besides moving my husband’s career forward (more on that here), what that made me realize, FINALLY, was that me worrying about this exact thing for 15 years didn’t prevent it from happening. It still happened. All the worrying did was make me miserable. Worrying is something I struggle with in other areas of my life as well. 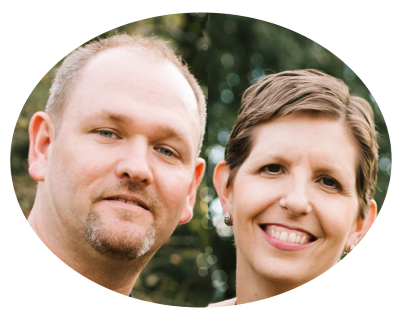 I have large wooden signs inscribed with Philippians 4:6 on them in our family room/kitchen, where I am most of the time when I’m home. Can I tell you how many times a day I say this verse to myself and then stop and pray. A lot! For so many years I lived in the constant state of worry. What if . . . . What if . . . What if . . .
After this wakeup call, a serious talk with my chef/husband about my struggles with worrying, and this Bible verse constantly in front of me, I struggle with it less. It’s still not easy, and unfortunately, it took a pretty bad car accident to get my attention enough so I would work on it. But sometimes that’s what it takes. 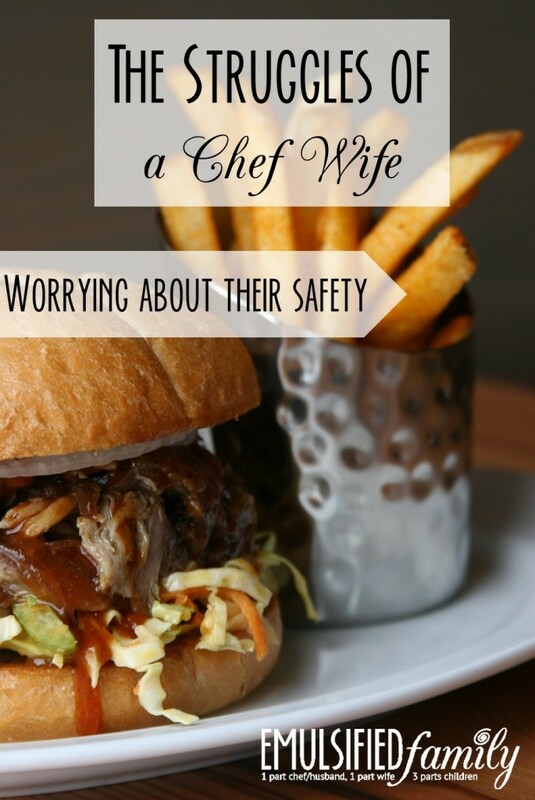 Worrying about my chef/husband’s health, safety, etc. will not change anything, EVER! Instead, what it does, is make me miserable, give me a stomach ache, prevent me from sleeping, make me impatient with the kids . . . the list could go on and on. Is it really worth it? What about you? Do you struggle with worrying about your chef’s health and safety? How do you handle the worry and concern? Let me know in the comments below. 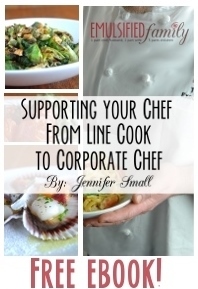 Follow Jennifer @ Emulsified Family’s board Married to a Chef on Pinterest. Yet another beautiful post. I do struggle with worrying, but it’s gotten better the older I become because I realize how much time I wasted on it. It’s far easier to ride with the punches of life than it is to worry about where the punches are coming from. I’ve wasted a lot of time on it as well. That’s a good way to look at it too! !